Buy and get 1 hour of FREE cleaning on your first Helpling booking! Clorox® is a leading manufacturer and marketer of some of consumers’ most trusted and recognized brand names, including its namesake bleach and other cleaning products. Clorox® Bleach, derived almost 100 years ago from a salt pond, is now a cleaning essential used in homes throughout the world. Clorox has been in this region for over 50 years. 1. 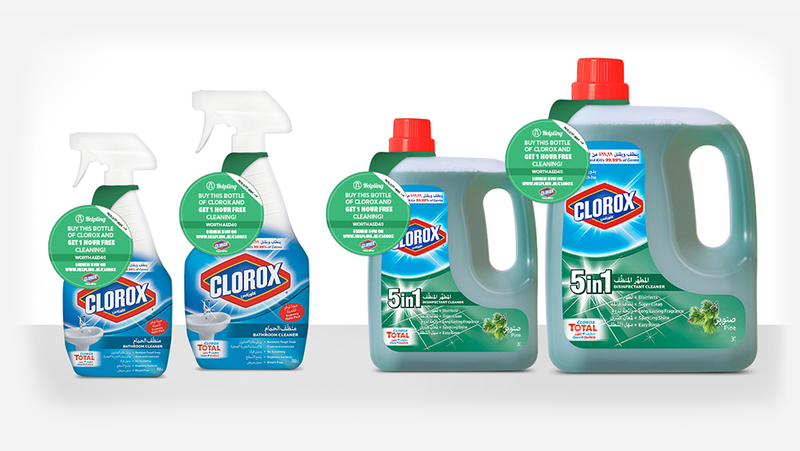 Buy a Clorox Product (Trigger or 5in1). 2. Peel off sticker for 1h of FREE cleaning. 5. Enjoy a clean home. Two great brands, Helpling & Clorox come together to offer you an ultimate clean home experience. After you have successfully booked a cleaning with your special Clorox voucher code, you will be entered into a raffle where you can be one of the many lucky winners who will get a Clorox/Helpling hamper delivered to your home during your Helpling cleaning. Helpling.ae is currently only servicing Dubai. Bookings are subject to availability in requested area and time. Only 1 voucher may be used per person. Helpling terms and conditions apply. Offer valid until June 15, 2016.